In 1517 Sri Rupa Gosvami and Sri Sanatana Gosvami, his elder brother went to Vrindavan to fulfill four orders of Lord Caitanya: (1) To uncover Sri Krishna’s lost pastime places. (2) To install Deities establishing first class puja. (3) To write bhakti-sastras. (4) To propagate the science of Bhakti Yoga. Sri Rupa Gosvami lived a mendicant’s life absorbed in hearing, chanting and writing about Sri Sri Radha-Govinda’s sweet loving pastimes in Sri Vrindavan Dham. Sri Rupa Gosvami wrote many profound yet practical transcendental books. He established Sri-Sri Radha-Govindaji, the beloved Deities of the entire Gaudiya sampradaya. Through extensive Vedic research Sri Rupa Gosvami proved that Sri Caitanya’s teachings present the highest philosophy and the perfection of religion. Sri Caitanya Mahaprabhu asked Sri Rupa Gosvami to write books on the science of Krsna Consciousness. In the Caitanya-candrodaya, Sri Kavi Karnapura says that Sri Rupa Gosvami is the form of true love and devotion. Sri Caitanya empowered him to explain His own love and devotion, and to propagate it to the world. Lord Caitanya manifested His own pastimes through Sri Rupa Gosvami. He received the title bhakti-rasacarya (guru of devotional mellows) for his devotional classics, Bhakti-Rasamrta Sindhu, which Swami Srila Prabhupada translated and commented on in his famous book, The Nectar of Devotion, and others. 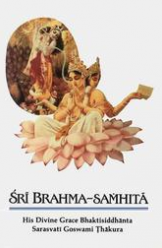 Bhakti-Rasamrta Sindhu gives the essence of all Vedic scriptures regarding the kingdom of bhakti. It explains how to advance in Krishna consciousness and attain Krsna Prema, pure unalloyed love for Our Sweet Lord. To understand the loving affairs of Radha and Krishna, Narottama Dasa Thakura says you must serve the lotus feet of Sri Rupa Gosvami with intense eagerness. Serving means hearing, chanting and following the teachings of Sri Rupa Gosvami as explained to us by Swami Srila Prabhupada. Serving also means praying to, crying out to, meditating upon, and dedicating your entire life to the lotus feet of Sri Rupa Gosvami (Sri Rupa-manjari). Sadhana Dipika states that those on the path of devotional service must always associate with Sri Rupa Gosvami’s doctrines on prema-bhakti. By the grace of Sri Jiva Gosvami and Swami Srila Prabhupada we can understand the transcendental truths of Rupa Gosvami’s teachings. When Sri Rupa Gosvami would sit in his bhajana kutir at Ter Kadamba and write about the separation that Sri Radha and Sri Krishna felt for one another the leaves of the Kadamba tree would fall down. When Sri Rupa wrote about Radha and Krishna’s ecstatic loving reunion, that overjoyed Kadamba tree immediately sprouted new leaves and blossomed flowers. By the mercy of a pure Vaisnava like Srila Rupa Gosvami this Kadamba tree could understand and appreciate the intimate and confidential subject matters of Sri Sri Radha Krsna Prema. Sri Rupa Gosvami established the Deities of Radha-Govinda in Vrindavan. Bhakti-ratnakar quotes one song from Srinivasa Acarya to describe the beauty of Rupa Gosvami’s beloved Sri Govindaji Deity: “Having seen the incomparable beauty of Sri Govinda, Sri Radhika begins describing it to Her sakhis: ‘Who has sculptured that moon-like face and who has sculptured those two lotus eyes? Only My heart knows how I feel when I see Him. Who has shaped His earrings, cut carefully in gems? My mind is fixed on them. His nose pearl surrounded by a golden ring looks like a moon-like white flower surrounded by lightning, smiling from behind some blue clouds. Today in Jaipur, Rajasthan Sri Rupa Gosvami’s original Deities of Radha-Govindaji are forever expanding their unlimited beauty. Every day 10,000 devotees attend Their mangala arotika. A prati-bhu Deity of Govindaji resides in the “new” Govindaji temple behind the historic masterpiece of architecture that once served Radha-Govinda in Vrindavan. Sri Krishna Dasa Kaviraja says the Deity of Radha-Govindaji shows us how to worship Radha and Krishna. Radha-Govindaji accepts our service and gives us inspiration to increase our surrender on the path of bhakti. Acting as our siksa-guru, Sri Govindaji directs us and gives us opportunities to serve Him. Some authorities claim that in 1564 Sri Rupa Gosvami entered Radha-Govindaji’s nitya-lila, just twenty-seven days after the disappearance of Sri Sanatana Gosvami. Sri Rupa Gosvami’s samadhi and bhajana kutir are in Seva Kunja within the courtyard of the Radha-Damodara temple. Sri Rupa Gosvami’s samadhi is on the front cover. Srila Rupa Goswami entered samadhi in the year 1564 and his sacred body was entombed at this very site by his beloved disciple and nephew Jiva Goswami. Through his writings Srila Rupa Goswami chalked out the perfect spiritual path for all the followers of Lord Chaitanya down through the ages. Swami Srila Prabhupada has put into English in all his many books the nectar knowledge of Sri Rupa Goswami and all the great guru acharya’s in our Gaudiya Sampradaya Disciplic succession. Rupa Goswami first met Lord Chaitanya at Ramakeli in 1514, and along with his brothers Sanatana and Anupama, completely surrendered to the lotus feet of the Lord. At that time all three brothers were employed as important ministers in the Mohammedan government of Bengal under Hussain Shah. Lord Chaitanya assured them that since they had surrendered to Krishna, they would soon be delivered and would be able to join the Sankirtan movement. It was Rupa Goswami who more than anyone else, firmly established the Sankirtan Movement of Lord Chaitanya. He wrote a large number of important books on the science of bhakti-yoga and after the disappearance of Lord Chaitanya in 1534, Rupa Goswami became the leader of all the Gaudiya Vaisnavas in the world. After teaching Rupa all the important aspects of devotional service, the Lord sent him to Vrindavan to compile books on these very teachings. After spending some time in Vrindavan, Sri Rupa and Sanatan left to visit Lord Chaitanya in Puri. On his way to Puri, Rupa Goswami started to write a drama about Lord Krishna’s pastimes in Vrindavan and Dwaraka. On arrival at a village named Satyabhamapur in Orissa, he had a dream that a beautiful woman appeared before him and asked him to write a separate drama about her. When Rupa awoke the next morning he realized that she was Lord Krishna’s most possessive queen, Satyabhama, and decided to write a separate drama about Dwaraka. On Rupa’s arrival at Jagganatha Puri, he met Lord Chaitanya and showed the Lord the outline of his two dramas. The Lord confirmed that writing two dramas mixing the lilas of Vrindavan and Dwaraka was not proper as their was a vast difference between them. In Vrindavan the Lord enjoys the madhurya-rasa, where as in Dwaraka He enjoys the Swakiya-rasa. Lord Chaitanya as well as Ramananda Raya were delighted to read the early drafts of these two dramas, which were eventually called Vidagdha Madhava and Lalita Madhava respectively. These two works are considered by Gaudiya Vaisnavas to be the most important dramatic literatures in the Sanskrit language. Rupa Goswami stayed ten months in Puri and received further instructions on devotional service from Lord Chaitanya. The Lord then asked Rupa to proceed to Vrindavan and complete the task of rediscovering the lost holy places of Lord Krishna’s pastimes. On returning to Vrindavana, Rupa Goswami discovered at Brahma Kunda the Deity of Vrindadevi, from who the town of Vrindavan takes its name, this Deity was later moved to Kamyavana. Rupa Goswami also discovered the famous Govindaji Deity and immediately established Lord Govindaji’s worship on a grand scale. On hearing the good news of Rupa’s progress, Lord Chaitanya sent some of his best men to assist Rupa Goswami in serving the Deity of Govindaji and establishing the Lord’s mission in Vrindavan. Rupa and Sanatana Goswami’s were joined by Ragunatha dasa Goswami, Gopal Bhatta Goswami, Raghunatha Bhatta Goswami and Srila Jiva Goswami. These great personalities become famous as the six Goswamis of Vrindavan. 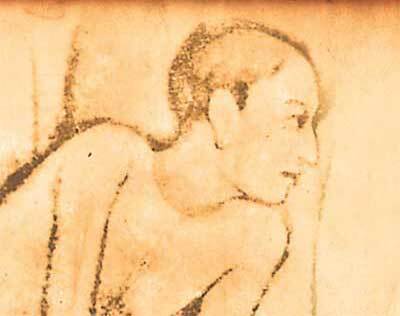 Jiva Goswami, who was the son of Rupa’s brother Anupama, became the most important disciple of Rupa Goswami. All glories to Sri Rupa Goswami and all six Goswami’s of Vrindavan! All glories to our Jagat guru Swami Srila Prabhupada who brought Vrindavan and the six Goswami’s to the world!